Thousand Character Chinese Classic – Writer. Traveler. Tea Drinker. This is always super fun. Students freak out when I assign it to them, but then they quickly realize class is much more fun and silly and it’s a great note to end the school year on. Students tend to also prepare prizes to encourage each other to participate and speak more, usually chocolate or some little snack. But in one class, they made an appropriate prize. Two students worked together to teach both Chinese and English calligraphy and they had all of us “students” try it out. (When they teach I am a student.) We wrote both fancy styles of Chinese characters and English based on what they showed us. Instead of a lollipop or some chocolate they handed me a scroll with lot’s of Chinese characters on it. “What’s this?” I asked opening it up and looking intrigued. A part of the 1000 character classic. “And it’s one story?” I asked. “Yep,” the students told me. Intrigued I was still looking at it on my walk home when I ran into three other students. “And what’s the story?” I asked. My students looked at each other. “It’s 1000 words to make one story,” another one said. “I know…” I said. “But what’s the story?” One looked closer at the paper and the other just kinda shrugged. “It’s kinda deep,” said one. “So you’ve never read it?” I was under the impression it was a important thing in Chinese literature so I thought they would know a lot about it. “How old is it?” I asked. “Maybe 100 years,” one student said. So basically my students were no help. When I got home, I fired up the Google machine. It seems that this piece of writing is much older than 500 years even, more like 1500 years old. 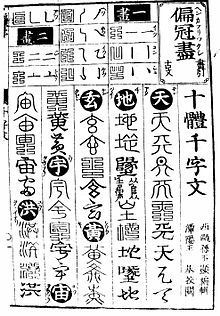 One of the origin stories of this writing is it was made at the request of Emperor Wudi to teach his sons calligraphy. Since it’s been used for hundreds of years, and used especially to practice calligraphy, you can find many different styles throughout many different historical eras. It was also used as a numbering tool, since back in the day everyone knew the entire essay by heart, if you mentioned a line, you would know that was line number 45 or whatever, so things could be categorized by it. What Wikipedia, and other several websites don’t tell you is the content of the essay. I did find an English translation and it says it is a text about life, human nature, the way of the world and so on. Of course some of the content is superstitious, perhaps oppressive, or undemocratic, or gender biased by today’s standards, but that is why a teacher is needed, to provide the historical understanding of the past, of its areas of darkness and ignorance, and place it in a constructive and progressive present context. To get a little idea of the content, this is his translation of the first line. The sky was black and earth yellow; space and time vast, limitless. So you can see that it is indeed quite deep in it’s meaning and understanding. Girls admire the chaste and pure; boys, the talented and good. Wellll….ya know, it was a long time ago. But still…. sigh. So while I’m not going to model my modern woman’s life around this essay, I think it’s a very cool part of China’s literary heritage and if you are interested in traditional Chinese thoughts, or calligraphy, a cool resource. Glad a copy of it ended up in my hands. Becky, hi! I came upon this page when looking up on the Thousand Word Classic Essay and was delighted and touched by your encounter. The thing with texts that makes them classic,is that the words of wisdom resonates throughout time, whether now or then, in some way or another, because we share the same human nature as our ancestors. Certainly in those days females are oppressed and men, chauvinists. But I’d like to think that as parents we’d still like to have our girls grow up chaste and pure relative to those who intentionally behave otherwise, and for our boys to aspire for greatness than to be good-for-nothing. The text simply mentioned this as an observation, a statement. It doesn’t say oh if you’re not chaste and pure it’s no good etc. Indeed it elaborates no further, wisely knowing that everything is relative. It’s up to the reader to interpret based on his/ her own experience/ understanding. And lucky us to be in this age, while I’m not sure if boys admire the chaste and pure amongst themselves *haha! *, but we definitely look up to girls who are talented and good.